The Trademarks Law of the Gulf Cooperation Council States – adopted by all Gulf Cooperation Council member states including Bahrain, the United Arab Emirates, Qatar, Kuwait, Oman and Saudi Arabia. The law entered into force in Saudi Arabia on 27 September 2016 by virtue of Royal Decree M/51 (26/07/1435H). The Implementing Regulations of the Trademarks Law of the Gulf Cooperation Council States adopted by the Commercial Cooperation Committee of the Gulf Cooperation Council States in June 2016. The Anti-commercial Fraud Law promulgated by Royal Decree M/19 (23/04/1429H corresponding to 29 April 2008). The Implementing Regulations of Anti-commercial Fraud Law issued by Ministerial Resolution 155 (06/01/1431H corresponding to 23 December 2009). The Border Measures Regulations issued pursuant to Ministerial Resolution 1277 (3 July 2004). A person who holds a trademark registration in Saudi Arabia or who has priority through an earlier filing date has the legal right to oppose the registration of an identical or similar trademark by any other person in Saudi Arabia for identical or similar goods or services. The owner of an unregistered well-known trademark in Saudi Arabia has the same legal right to oppose the registration of the identical or similar trademark by any other person for the same goods or services in which the famous trademark is used. A person with priority over a trademark in Saudi Arabia, whether by use or registration, has the right to file an action to cancel the registration of the later identical or similar registered trademark by any person in Saudi Arabia for the same or similar goods or services in which the trademark is used or registered. A registrant of a Saudi trademark, as well as the owner of a famous trademark which is not registered in Saudi Arabia, has the legal right to file an action against any person to prohibit the use of an identical or similar trademark in Saudi Arabia for identical or similar goods or services. The registrant of a Saudi trademark can keep its trademark on the watch list of the Saudi Customs Authority to prohibit any third party from importing goods into Saudi Arabia bearing an identical or similar trademark. the Convention on the Recognition and Enforcement of Foreign Arbitral Award, New York 1958, ratified by Saudi Arabia on 19 April 1994. The parties to a commercial contract are free to agree on the arbitration clause, whereby they refer any dispute that arises from the implementation or interpretation of the contract to an arbitration committee within or outside Saudi Arabia. In the same manner, the parties to a lawsuit before the Commercial Court can request the court to stay the proceedings and refer the dispute to an arbitration committee. However, in all cases, any accusation or issues of a criminal nature are exempt by force of law from the scope of the arbitration agreement. If the arbitration is conducted within Saudi Arabia, the Commercial Court of Appeal is the competent court to admit the petition of arbitration and controls the arbitration proceedings. The final judgment issued by the Commercial Court of Appeal based on the arbitral award is enforceable in Saudi Arabia by a petition to be filed by the judgment creditor to the competent execution court. If the arbitration is conducted outside Saudi Arabia, the foreign arbitral award is enforceable in Saudi Arabia by a petition to be filed by the award-creditor to the Riyadh Execution Court, provided that all legal requirements are satisfied, including the fact that the award does not violate any principles of Sharia law. The Administrative Court is the first-instance court in the Administrative Court System. Judgments issued by this panel are subject to appeal before the Administrative Court of Appeal. The Administrative Court of Appeal is the appellate authority in the Administrative Court System and is available in any main city in Saudi Arabia. The judgments issued by these panels are final and enforceable, unless an issue of law arises. In such case, the judgment is subject to further appeal by way of cassation before the Supreme Administrative Court. The Supreme Administrative Court is the highest judicial authority and ensures the correct application of the law and principles of Sharia law by the Administrative Court of Appeal. Trademark disputes in Saudi Arabia are mostly administrative in nature and fall within the jurisdiction of the Administrative Court. Oppositions against acceptance of trademark applications, appeals against refusal of trademark applications and trademark cancellation actions are all administrative where the regulatory authority of trademarks is involved (ie, the Ministry of Commerce and Investment). Trademark infringement disputes fall within the scope of jurisdiction of the Commercial Circuit. The judgments issued by the Commercial Circuits are subject to appeal before the General Court of Appeal and the judgment of this court is final and enforceable, unless an issue of law arises in which case the judgment is subject to further appeal by way of cassation before the Supreme Court. Under Saudi trademark law, there are clear provisions relating to the award of damages in trademark infringement cases. However, the award of damages is dictated by the principles of Islamic Sharia. The principles of Islamic Sharia require a heavy burden of proof to establish actual damage. An additional requirement for the award of damages is that the damage suffered by a claimant should be based on the infringing act of the defendant. The cause and effect relationship excludes the possibility of awarding speculated damages or unquantifiable damages (eg, damages claims against reputational harm). Damages can be claimed in the statement of claims filed against infringement of the trademark. Saudi trademark law provides a non-exhaustive list of parameters for calculating damages as a guideline to the court. Award of damages to the plaintiff may be based on profit earned by the defendant and the value of goods or services infringed. Such value should be based on the retail price of such goods or services or any other criteria which the court deems fit under the circumstances. In case of deliberate imitation of the established mark, the aggrieved party may claim for an award of adequate compensation other than the profit earned by the infringer. The court has the discretion to award any amount in compensation to the plaintiff. In practice, Saudi courts rarely grant compensation, due to the heavy burden of proof required under the Sharia principles. the Commercial Court with jurisdiction over trademark infringement matters – a statement of claims must be filed before the court in writing. In a few cases, courts have ruled out that filing a complaint before the Anti-commercial Fraud Department is a prerequisite for the Commercial Court to admit and review an infringement action. A statement of claim must be filed with the competent Commercial Court along with evidence, including proof that the plaintiff filed a complaint against the infringer before the Anti-commercial Fraud Department. The court usually takes two months to summon the defendant for the first hearing. Depending on the complexity of the issues in the case, its conclusion may take 15 to 20 months. If a claimant intends to claim for damages, in such cases the Commercial Court is the right option. financial penalties ranging between $270 and $266,700 may also be imposed (depending on the nature of the infringement) – such penalties may be doubled in case of repeated infringement. Criminal prosecution can be initiated solely by a public prosecutor on recommendation from the Anti-commercial Fraud Department. The rights holder is entitled to file the complaint before the Anti-commercial Fraud Department against the infringer and the infringer is not entitled to join the criminal prosecution when established by the general prosecutor. Under the law, interim and permanent injunctions are available for the rights holder. A rights holder may request a preliminary injunction in case of prima facie infringement. Such a request should be based on evidence of infringement based on registered trademark rights. The plaintiff must prove that until the final decision, there is a significant chance of irreparable damages to the plaintiff. In practice, Saudi courts rarely grant interim injunctions. that the defendant’s trademark is similar or identical, or has imitated the dominant part of the plaintiff’s trademark and that the defendant is not authorised to use the trademark. In cases of cancellation action, the first requirement will remain similar to that stated above for infringement actions (ie, the rights of the plaintiff over the trademark must be established). In addition, the plaintiff must prove that the defendant has unlawfully registered the trademark and the period of registration does not exceed five years; otherwise, the plaintiff must prove the bad faith of defendant in registering the trademark. In a non-use cancellation action, it is the plaintiff that must prove, based on the market investigation, that the defendant has not used the trademark for five consecutive years in Saudi Arabia. Saudi courts usually demand an investigation report from an independent party at the cost of the plaintiff to prove its claim of non-use. In any action based on the well-known mark, all the above elements should be proved by the plaintiff. If a well-known mark is actually used in Saudi Arabia, it is very convincing in proceedings. Over the past few years, Saudi courts have shown significant recognition towards unregistered well-known trademarks. the defendant’s use of the mark is in good faith and without knowledge of the registration of a similar or identical trademark in Saudi Arabia. The doctrine of laches is not recognised in Saudi Arabia in trademark disputes (except in ownership disputes where the law specifies time limits to challenge unlawful ownership clearly). In infringement and cancellation or invalidation proceedings, the Court of Appeal is an appellate forum against first-instance court decisions. Within 30 days of issuing a decision, an appeal may be filed on point of law or point of fact, and new evidence may also be submitted. If the Court of Appeal accepts the appeal, it remands the case back to the first-instance court for retrial. A retrial may be on a specific observation as raised by the Court of Appeal, or for the case as a whole. A fresh decision by the first-instance court in a remanded case is appealable again to the Court of Appeal, in which case the Court of Appeal issues the final decision. Appeal against refusal of trademark application and opposition proceedings are filed with respective trademark committees. The decision of the Trademark Appeal Committee and Trademark Opposition Committee can be appealed to an administrative court within 60 and 30 days respectively. The further appeal process is similar to the above. the value of the mark and the extent of its impact on the promotion of goods or services for which the mark is used. a party to the proceedings may request information that is within the possession or control of another party to the proceedings; however, it is solely within the discretion of the tribunal or court to ask for disclosure of any documents. Saudi courts, at their own discretion, can appoint an expert for submission of the expert report without intervention from litigating parties. In such case, the expert’s fee will be paid by the litigating party as per instructions of the court. volume of use in the market. Survey evidence is easily acceptable and convincing before the court if it is produced by an independent licensed expert and authenticated by the Chamber of Commerce and Industry. Mohammad Jomoa is partner and CEO of Kadasa Intellectual Property (formerly Kadasa & Partners). Mr Jomoa has 28 years of diverse IP experience, especially in trademark and patent litigation. He regularly advises clients on techno-legal issues in the Middle East and the Saudi government on IP legislation. He has acted as external counsel for many pharma companies and worked extensively on data protection, patent linkage and pharmaceutical laws. He is a regular speaker on IP issues at local universities. A chemical engineering graduate from the University of Toledo, Ohio, he also holds a postgraduate diploma in IP law from the Franklin Pierce Law Centre and the Gulf Institute for International Law. Tariq Zain is a senior legal adviser in intellectual property and heads the IP litigation team. He has worked with Kadasa Intellectual Property for 20 years. Mr Zain is an expert on the commercial laws of Saudi Arabia and has represented many pharmaceutical companies in legal disputes across the kingdom and regularly attends patent opposition cases before the Gulf Cooperation Council and Saudi Patent Office. He has in-depth knowledge of Saudi civil and criminal procedures and its intersection with Sharia law. 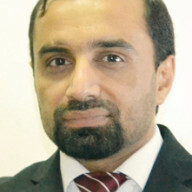 Asif Iqbal is head of IP legal in Kadasa Intellectual Property. He is a graduate of law and business administration, and has a World Intellectual Property Organisation (WIPO) administered LLM in IP law from the International Training Centre of the International Labour Organisation at the University of Turin, Italy. After joining Kadasa IP in 2015, he regularly advises clients on multiple IP areas including trademark, copyright, domain names and patent legal matters, especially in infringement proceedings and the intersection with pharmaceutical laws. His past experience includes engagement with a leading IP consulting firm. He also served as assistant director at the National IP Office of Pakistan for five years, where he was engaged in different IP and administrative roles. With Kadasa IP Mr Iqbal deals extensively with IP portfolio management and advises on trademarks, patent legal matters and domain name disputes. He has attended multiple international WIPO conferences and workshops as a participant and speaker. He is a member of the International Trademark Association and has authored several articles and commentaries on IP issues.